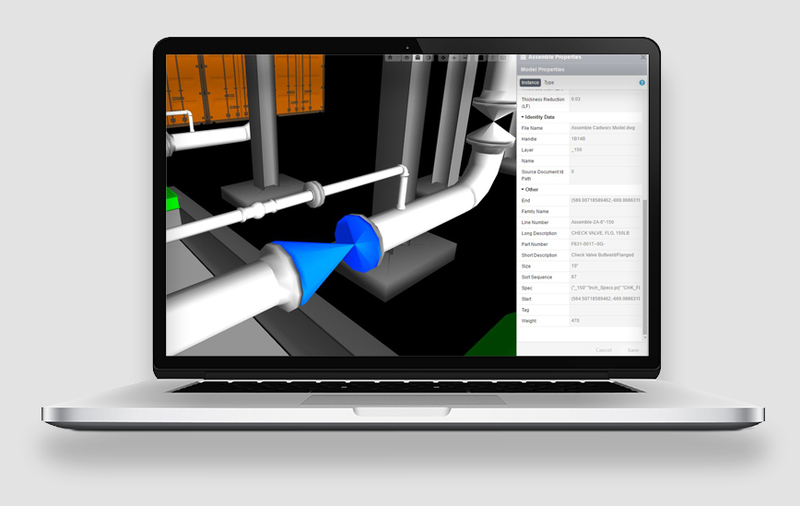 Assemble enables access to data within the 3D plant design to minimize risk, understand scope and improve project efficiency. Learn how Assemble can help with industrial projects to do model-based takeoffs, advanced design review, and manage and track changes in real-time. Fill out the form to learn how Assemble helps improve capital projects! Assemble has helped us cut our estimating time by 50%. Our team uses the time-savings to concentrate on high value activities to deliver cost savings to the owners and improve project results.- CLIFTON COLE, BIM MANAGER, THE PENTA BUILDING GROUP. With the evolution of BIM, and 3D modeling becoming an integral, daily part of our profession, Assemble poses to be a great tool to have on our belt. - ROBINS & MORTON. Assemble provides us with immediate insight into design changes, which enables us to respond faster to the process of the change. Without Assemble, identifying the scope differences and quantifying their cost impacts took days or even weeks, now it takes just minutes.- KEVIN BROMENSHENK, BIM MANAGER, FLINTCO.